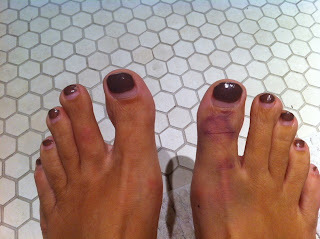 First, that toe looks like it hurts. I think you should sit with your foot up and rest :). 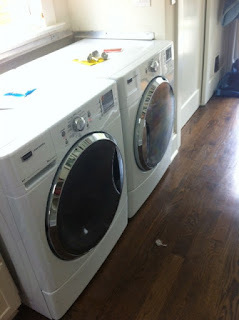 Second, did you have to take out the countertop to put in the fancy new washer and dryer? I did have to take off the counter top, but it is not glued on so it just slides out with a bit of wiggling. I can't do it by myself because it weighs a ton, but Rob and I can do it together. Its back on now!